When a Chinese monk broke into a hidden cave in 1900, he uncovered one of the world's great literary secrets: a time capsule from the ancient Silk Road. Inside, scrolls were piled from floor to ceiling, undisturbed for a thousand years. The gem within was the Diamond Sutra of AD 868. This key Buddhist teaching, made 500 years before Gutenberg inked his press, is the world's oldest printed book. The Silk Road once linked China with the Mediterranean. It conveyed merchants, pilgrims and ideas. But its cultures and oases were swallowed by shifting sands. Central to the Silk Road's rediscovery was a man named Aurel Stein, a Hungarian-born scholar and archaeologist employed by the British service. Undaunted by the vast Gobi Desert, Stein crossed thousands of desolate miles with his fox terrier Dash. Stein met the Chinese monk and secured the Diamond Sutra and much more. The scroll's journey--by camel through arid desert, by boat to London's curious scholars, by train to evade the bombs of World War II--merges an explorer's adventures, political intrigue, and continued controversy. The Diamond Sutra has inspired Jack Kerouac and the Dalai Lama. 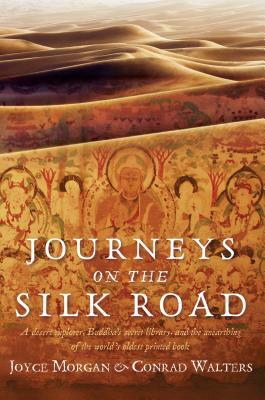 Its journey has coincided with the growing appeal of Buddhism in the West. As the Gutenberg Age cedes to the Google Age, the survival of the Silk Road's greatest treasure is testament to the endurance of the written word. Joyce Morgan has worked as a journalist for more than three decades in London, Sydney and Hong Kong. Her writing has appeared in The Sydney Morning Herald, The Australian, The Guardian and The Bangkok Post. She has written on arts and culture since 1994. Joyce is a senior arts writer at The Sydney Morning Herald and a former arts editor of the paper. She has also worked as a producer with ABC Radio. Born in Liverpool, England, she has travelled extensively in Asia, including India, Pakistan, China and Tibet. Conrad Walters has worked in the media for more than thirty years in the United States, where he won awards for investigative journalism, and in Australia, where he is a feature writer and book reviewer at The Sydney Morning Herald. Conrad was born in Boston, educated in Europe and the Middle East and has lived in seven countries. He has travelled widely through North America, Europe and Asia. He has a master's degree in Creative Writing from the University of Technology, Sydney. They live in Sydney, Australia.